You’re planning to have a fence installed, be it residential fencing or commercial fencing, but a Web search turns up pages upon pages of businesses offering fence installation in Toronto. While finding the contractor that’s right for you may seem like a daunting task, you don’t need to look any further than Total Fence Inc. We are the experts home and business owners turn to when they’re looking to install fences in Toronto and the surrounding area. Wood fences are a popular choice for both their classic look and durability. If you’re looking for wood fencing contractors in Toronto, you want someone who you know will take the time to install your wood fence with care using only the best materials. As the top wood fence contractors in Toronto, we at Total Fence Inc. offer our customers a free, no-obligation quotation on the cost. Regardless of the material you’re looking to use for your residential fence, you should always call a fencing contractor who only uses the best materials that stand up to the test of time. Whether you’re looking to have a wood fence or chain link fence installed, we offer the best fence materials in the industry. Our team of experts will visit your home and install your fence with minimal disruption to your life-and at an affordable price. When searching for a fence installation expert, you want one who will provide great work at a reasonable rate; after all, when it comes to something like fence installation in Toronto and the surrounding areas, you don’t want to cut corners! That’s why when you choose Total Fence Inc. as your fence installation experts, you get what you pay for-and more. 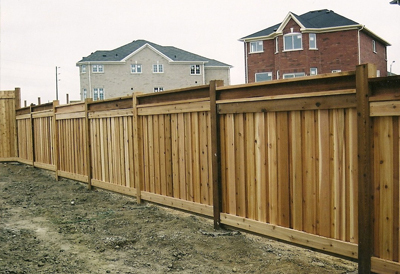 We aren’t just one of the best wood fencing contractors in Toronto; we also install fences made from a variety of materials, such as vinyl, chain link, and more. For our rural customers, we will install farm fences, as well as create dog kennels for pet owners, veterinarians, and kennel owners. When looking for someone to install fences in Toronto, you’ll also want to seek out a contractor who will provide examples of the types of materials they use. When you contact us, we will provide samples of our best materials, so you can determine what is best for you, regardless of whether you’re looking to have residential fencing or commercial fencing installed. Having the right fence can be important to a business for a variety of reasons, such as creating a pleasing look for customers. Another reason is if the company operates noisy equipment; whether it’s outdoors or inside, a sound barrier fence means that employees can work in comfort and won’t risk noise complaints. Regardless of the type of commercial fencing you’re looking to have installed, our team of experts will visit your business’ location and install it with minimal interruption to your operations. Our commercial fencing customers typically opt for chain link or ornamental iron fences, thanks to the durability of the material. Whether you’re looking for iron or wood fencing for your business, we’ll find the option that’s right for you! Best of all, we offer a free on-site analysis to determine what type of fence is ideally suited to you. From there, we will come up with a solution that’s suited to your budget. It’s just one more reason why you should turn to Total Fence Inc. to end your search for the best fence installation experts in Toronto.